Now if you want to save any image of Web just right click you can see "Save to Google Drive" and then two option's "Save Link to Google Drive " or "Save Image to Google Drive" . Its upto you to decide. On right click you will see this. "Save web content to Google Drive. The Save to Google Drive Chrome extension helps you save web content to your Google Drive. * Adds a right-click context menu to save hyperlinks, documents and media. This extension allow you to save web content directly to Google Drive through a browser action or context menu. 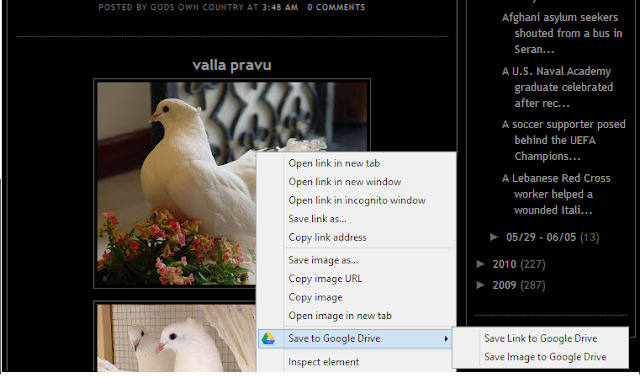 You can save documents, images, and HTML5 audio and video all by right clicking and selecting 'Save to Google Drive'. You can save the currently viewed page using the 'Save to Google Drive' browser action. The format of saved HTML pages can be controlled with the extension's options page (Choice of Entire image (default), Visible image, Raw HTML, MHTML, or Google Doc). You can automatically convert Microsoft Office files or comma separated files to Google docs format.